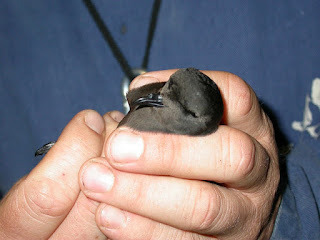 Storm Petrels are amazing little birds. Rarely seen on land during the day and spending the night in their burrows. For a bird which is similar in size to a Greenfinch this bird can make some impressive movements. One such Storm Petrel was ringed in Ona, Norway and controlled by another ringer three days later on the Isle of May (902km)! (Blue pins on map). Little is known about the winter movements out at sea but they usually leave UK waters in September or October and by November they are around the West African coast. They then head further south to moult near South Africa before making the reverse journey, to get to their breeding grounds in April. We have relatively few recoveries showing this movement as if they die this is likely to be out at sea but 28 have been reported in South Africa so far. Finding a Storm Petrel inland is not very likely but one was found on 17 Jan at Shimuwini Bush Camp, Kruger National Park, South Africa! The reason for this was probably a tropical cyclone blowing this bird off course. 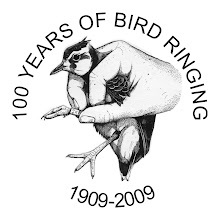 Luckily this bird was ringed and from the ring number we were able to tell them that this bird had been ringed 172 days earlier on Mousa, Shetland (9,776km, although it was probably more like 13,000km considering it had to fly round West Africa). (Red pins). Thanks to Mike Pennington for letting us know and Stuart Newson for the photo. I am pleased to see further B.T.O. research being undertaken behind the scenes. This is a fascinating blog, well worth following.